Outdoor Learning Residentials in the New Forest National Park. Throughout Key Stage 3 students develop their depth of knowledge, understanding of abstract concepts and how subjects connect with one another. They are encouraged to develop a growth mind set through engaging and challenge driven environments, in both our Field Studies programme and Adventurous Activities. Links to the National Curriculum can be seen throughout all sessions, with English, Maths and Citizenship being imbedded throughout. Each individual is challenged and stretched by our qualified instructors, as they work towards increasing initiative, commitment, personal responsibility and self-motivation. All of our activities are run with a personal development approach and 'Challenge by Choice' means that sessions are voluntary and individuals will not be forced to take part in any activities. 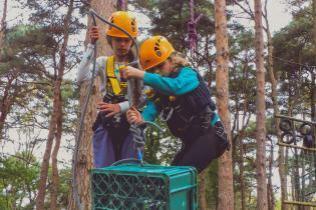 Our instructors ensure that every child works within their own personal ability levels and are encouraged to challenge themselves appropriately to help them build character. 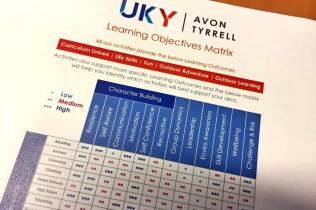 At Avon Tyrrell, we understand the importance of including National Curriculum links within the delivery of sessions, and will work closely with you throughout the development of your programme to ensure all goals are met. At KS3, we encourage a deeper exploration of topics, encouraging young people to be resilient learners, confident in themselves and their abilities. English, Maths and Citizenship are embedded into our sessions, and our sessions can be adapted to cover a wide range of subjects such as Science, Art, Design Technology and Geography.